Pakistan became independent and a member of the Commonwealth in 1947, with its capital at Karachi. This city, however, was unsuitable as a long-term capital and the Pakistani government set up a commission in 1958 to select the most suitable site for a new national capital. It chose an area in the north of the country, on the Potwar plateau below the Himalayan foothills and close to Rawalpindi, lying on the historic route from Tehran to Calcutta. The Greek architect and town planner, CA Doxiadis, who had been an adviser to the commission, was selected in 1959 to prepare the master plan of the city that was to be, in 1960, named as Islamabad. The resultant plan was a grid of principal roads about two kilometres apart that fanned out from an administrative centre south-west towards Rawalpindi. The diplomatic enclave was planned just to the south-east of the administrative sector and bounded by the Murree Highway and the National Park. Within this area, sites for offices and head of mission residences were to be slightly separated from the residential accommodation of other staff. Governments were invited in 1962 to select sites for their missions. The British high commission and the Ministry of Works selected seven sites: a large rectangle of 2.2 hectares, called Site A, for the offices and residence, composed of Plots 268-278 and 283-293; and six smaller rectangles, called Sites B-G, separated from each other by service roads and pedestrian paths, composed of Plots 1-78, totalling about 7.5 hectares for residential, amenity and ancillary uses. The seven sites were together taken in December 1965 on perpetual lease from 1962 for a premium of about £160,000. The move of the Ministry of External Affairs from Karachi to Islamabad took place in 1965, a year earlier than expected, requiring an accelerated move from Karachi for about thirty high commission staff. Temporary office space was therefore leased at, and a floor added to, Adil Chambers in Rawalpindi. The high commissioner, when in Islamabad, used a leased residence called Pembroke House at 90 Sixth Avenue, Ramna 6; and the deputy was in Hosain House (also known as Argyle Lodge) at Plot 116, Sector G6. 26 prefabricated bungalows, supplied by Taylor Woodrow (Building Exports) Limited, were built on Site C; servants quarters, community hall, sports amenities and services plant were built on Site G; and stores on Site E. These buildings were erected by direct labour at a cost of £275,000. It was not an easy contract, with shipping delays, cyclonic weather, and Indo-Pakistani hostilities. Before it was complete, the Capital Development Authority, which had given permission for the erection of the pre-fabricated bungalows, objected to their character and required their removal. Evidently, other missions aimed to follow the British example and the authorities feared for the appearance of the enclave. After difficult negotiations, the Authority accepted that the bungalows could be completed provided that their appearance was improved, their roofs painted blue-grey rather than white, and that they were removed before the end of 1968. The temporary encampment was thus occupied in January 1966, and named Windsor Close. 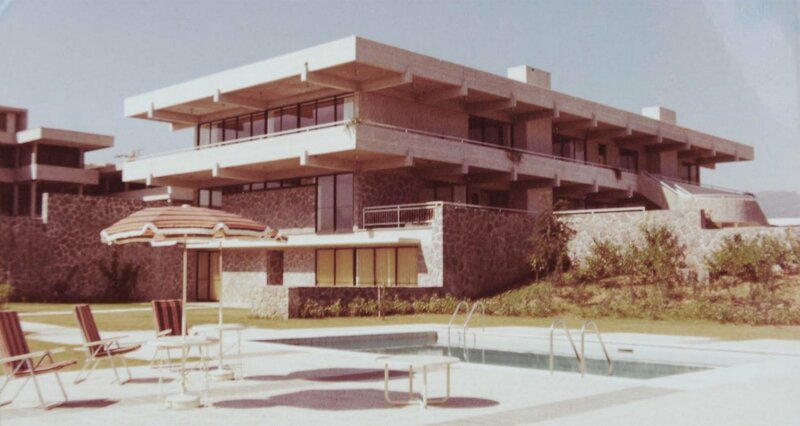 In 1966, the optimistic intention was that the high commission’s accommodation would be built in five over-lapping stages over a period of three years, at a total estimated cost of £3.3 million. The first stage was to be 29 junior staff houses; the second stage, the offices; the third, 35 more junior houses with community centre and hospital; the fourth, 23 staff houses for middle and senior grades (on the site that would by then be cleared of the temporary bungalows); and the fifth, the residence. Despite all this planning, actual design work on much of the accommodation was at a standstill because final agreement had not been reached with the Treasury about which floor space standards should be applied to the designs of the new buildings. The Treasury was aghast that accommodation was under consideration for about 250 local support staff and their families and held out for a drastic reduction in space requirements. 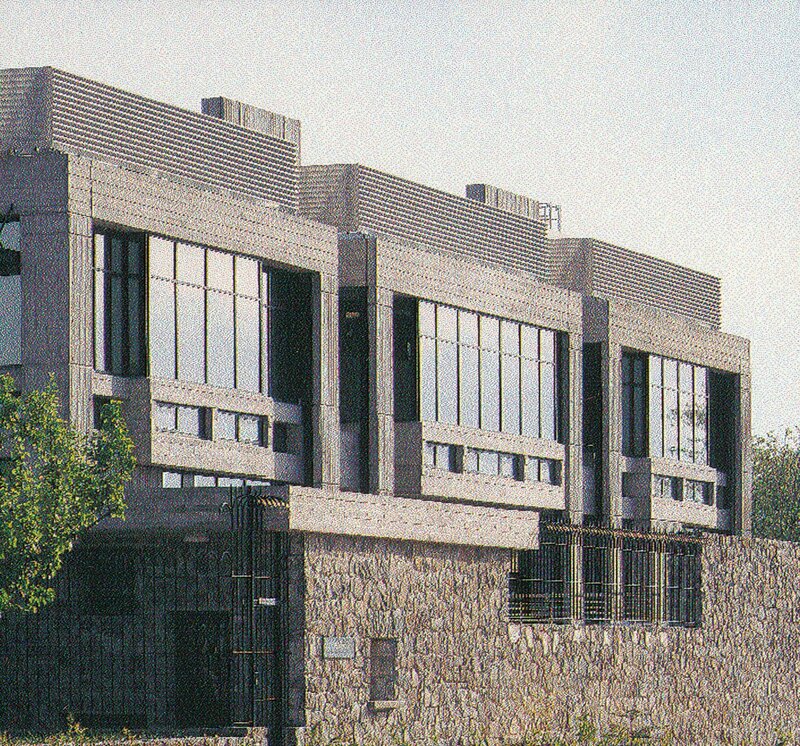 The in-house design team was led by William Bryant, superintending architect, and the project architects were Gordon Hindle and Tony Exley, succeeded by Adrian Bell. They were careful to consult about climate and building conditions: they sought the co-operation of Gerard Brigden, a colonial service architect in Islamabad, and they took on board as advisers in London the Architectural Association’s Department of Tropical Studies. The first phase was completed in 1968. 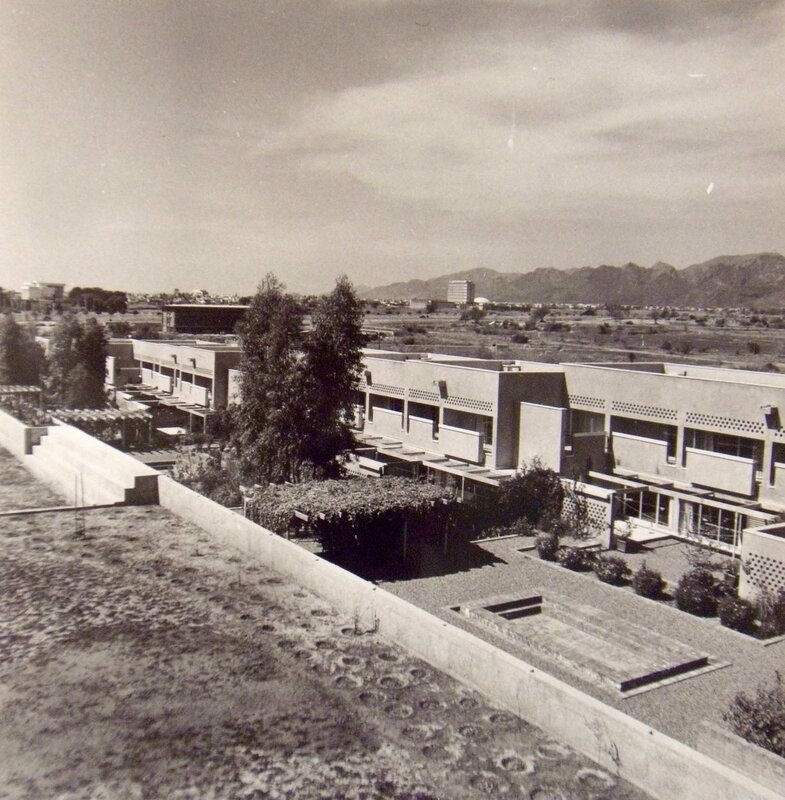 In the event, it comprised 26 junior staff houses, a cluster block of 66 single-unit servants’ quarters, and a plant house on Site B and part of Site D; stores on Site F; and a community centre and sports facilities on Site G. The second phase, the offices, with associated local staff quarters, was started early in 1968 and completed in December 1970: the cost was about £900,000. The third phase included eight more junior staff houses and another servants’ quarters cluster block on Site C, and eight junior staff single-bedroom bungalows on Site D. The fourth phase was the residence, completed in 1976. The phases, in practice, became became less distinct after the completion of the offices because it was by then clearer what were the most immediate priorities. Further works included six second secretary houses on Site C, and a first secretary house and the deputy high commissioner’s house on Site E. A permanent community centre and sports facilities on Site D, to replace those on Site G, were the last contracts completed, in 1979. Site G then became surplus and was surrendered in 1982 [or was that Site F?]. The offices comprised about 27,500 square feet of net area for about 150 UK and local (including menial) staff. The site was at the top of a shallow hill and nearly a million cubic feet of earth and stone were excavated and carried away by donkey. 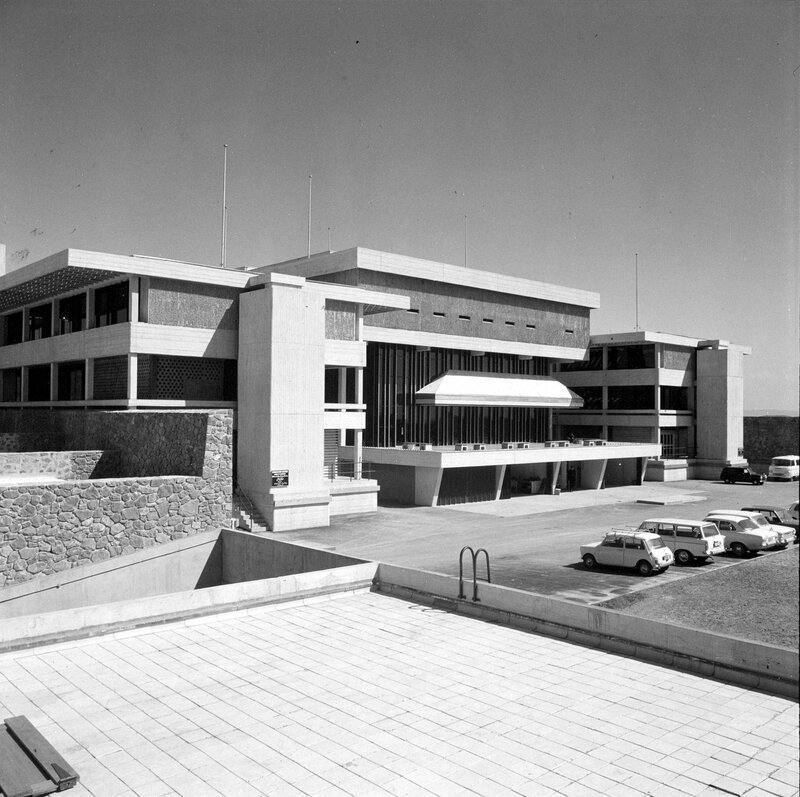 The building comprises a central four-storey rectangular block containing reception, waiting area, a small cinema and library on its lower levels and classified offices above. On either side of the central block, and slightly separate from it, lie two narrow three-storey blocks of unclassified offices, the gap being bridged once at each floor level. The structure is a reinforced concrete frame, with concrete block infilling and partitioning, clad with anodised aluminium curtain walling and glazing in grey-tinted glass from Crittall Hope Ltd. Plenty of local marble and stone appears both externally and internally. The building was fully air-conditioned by a high-velocity induced air system. The high commissioner’s desk and meeting table were made of Indian laurel by Heals of London, and the chairs were QEII design by Race Furniture. The tables in the entrance hall were, as the Department of the Environment press notice had it, were ‘of unusual design in lightweight concrete with tops in matt black plastic laminate’. 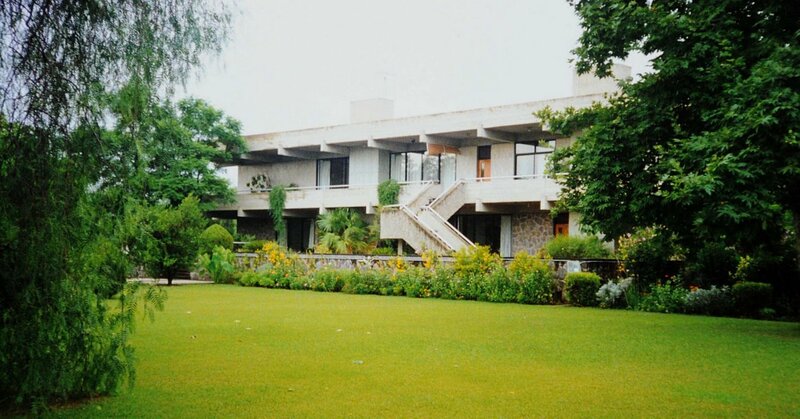 The new residence was designed by Adrian Bell in 1972-3 and built by Zor Engineering Limited of Karachi 1974-6. The plan was based on a 16ft. x 16ft. and 16ft. x 8ft. tartan grid. The building is mostly on two floors, with the reception rooms on the upper to take advantage of the magnificent views, and the high commissioner’s private areas and the service rooms on the lower. A couple of bedrooms are on a lower ground floor alongside the garden and swimming pool. The building is in reinforced concrete, with wide overhanging roof and balcony for shade, fair-faced externally and extensively finished internally in local Margala stone. English ash from Northamptonshire was used for ceilings, doors and frames. The two clerks of works were Pat Timothy and Douglas Peck. 42 staff houses were built in all, most of them of smaller size than the subsequently agreed scales permitted. Houses to lease on the market became more readily available as Islamabad developed and greater recourse to them was taken. Disposition of British high commission sites selected in 1962. 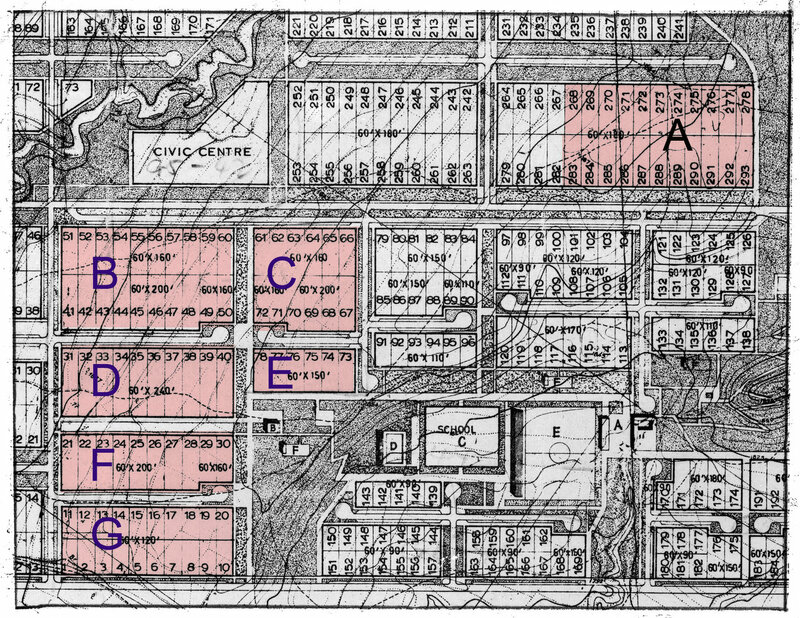 Siteplan of buildings executed and envisaged, 1976. Model of offices, from north-west, with residence at left, 1965. Offices entrance, east, front, 1973. 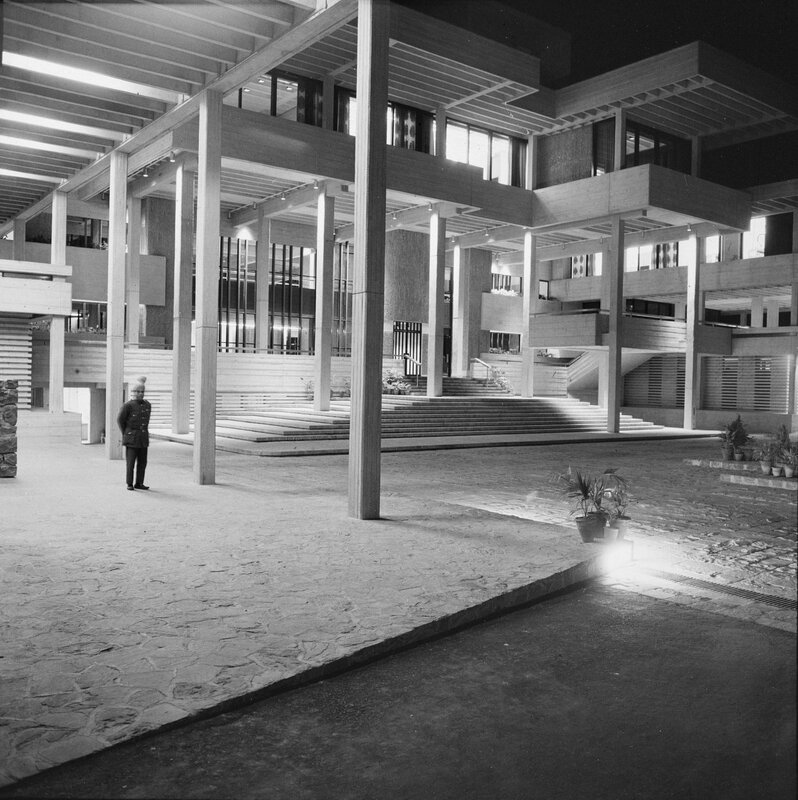 Offices entrance at night, 1973. 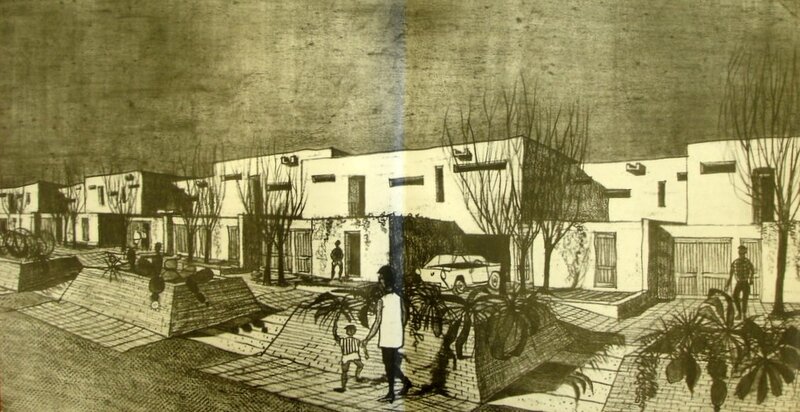 Sketch of proposed junior staff housing, 1965. 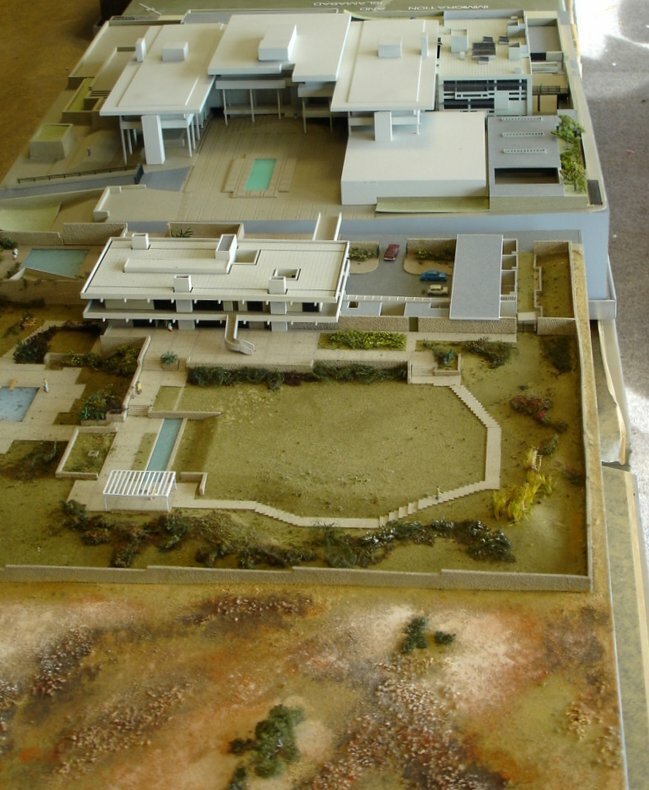 Residence model, 1972, in front of c.1966 model of offices, with 1990 new immigration building model inserted, back right. Residence from the garden, 1993. 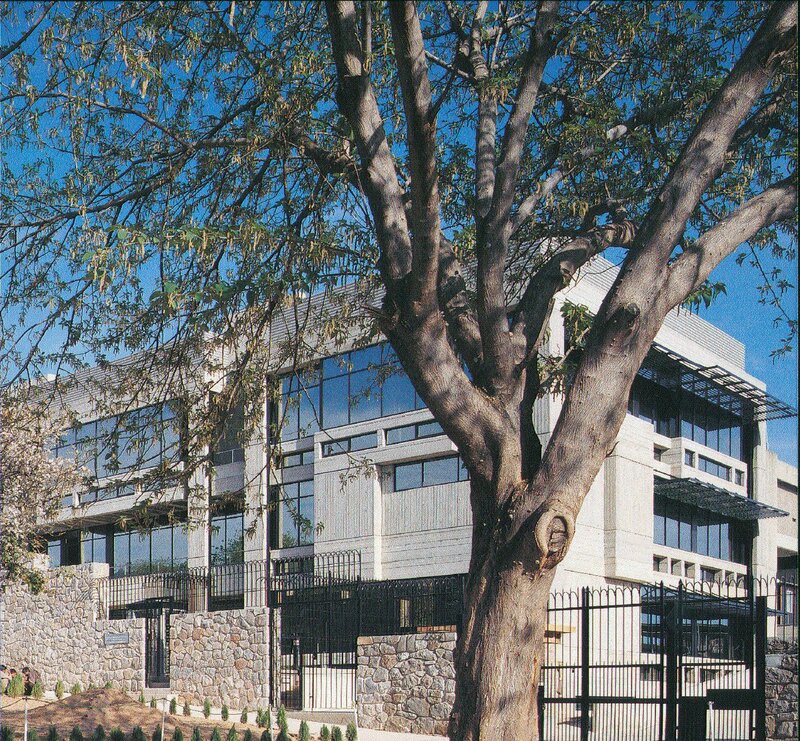 New immigration wing completed, 1993. New immigration wing, from north-west, 1993. 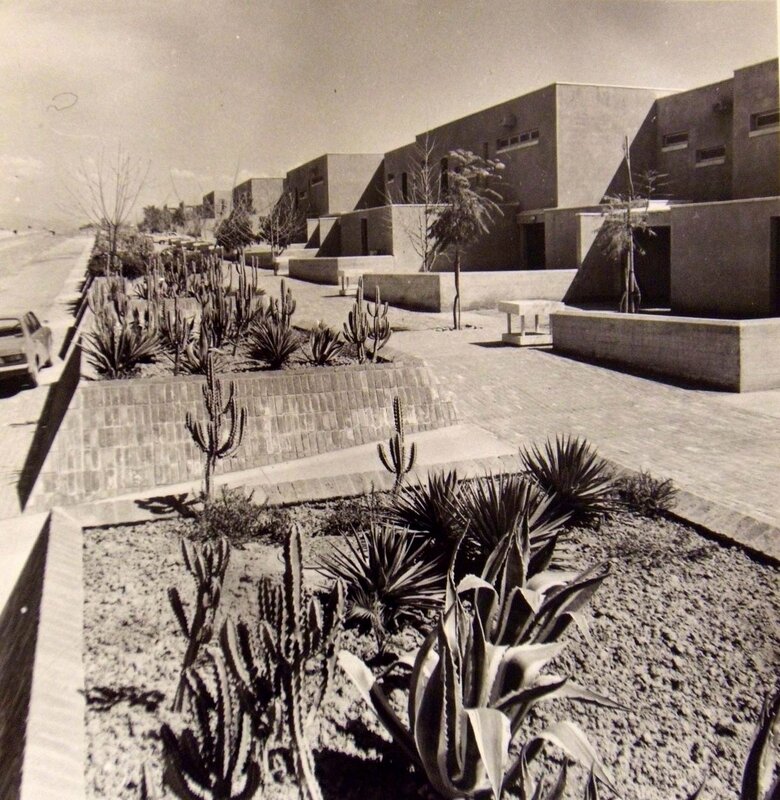 South end of residence, from pool area, 1976. 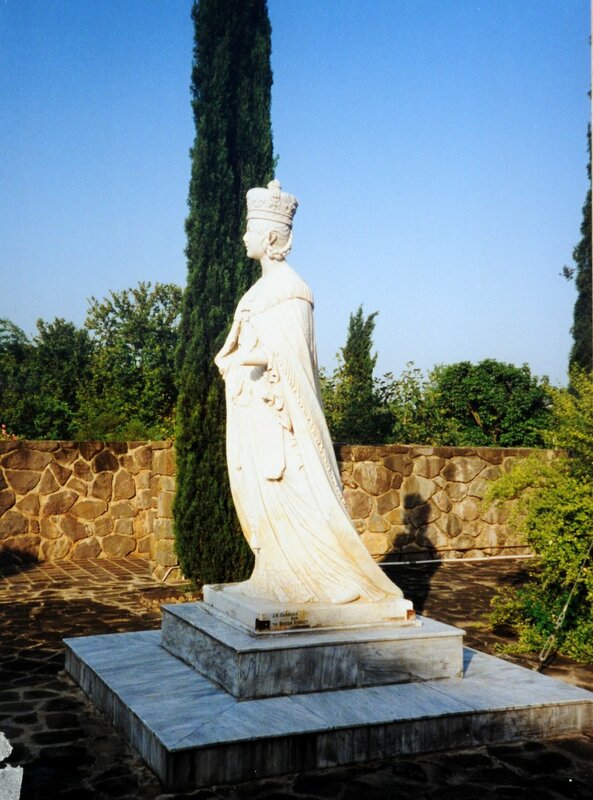 Queen Victoria in position, 1993. Karachi was the initial capital of Pakistan. A British high commission was established in 1947, with offices in leased premises and UK staff living in hotels and hostels, including an annex of the Palace Hotel. The high commissioner was living in Fairfield, in the centre of the governmental quarter. The intention was to find a site on which to build a single large hostel for about fifty UK-based staff. But many of the suitable sites had already been earmarked for other organisations: the Pakistan Navy required the suitable land at Chinna Creek; and the Sind government would not sell land on Bath Island. The choice became confined to land owned by commercial firms, as the result of which the freehold of the fifteen acre Port Trust Estate at Clifton was bought in January 1950 for £216,000 from the Trustees of the Port of Karachi. It had three good bungalows on it, and plenty of room for building new offices and hostel accommodation. The chairman’s house, Runnymede, could serve as the high commissioner’s residence; the chief engineer’s, York Place, as the deputy high commissioner’s house; and the traffic manager’s, Acton House, as the senior trade commissioner’s. In the event, no new buildings were undertaken on the estate during the 1950s: instead, the three houses were adapted sufficiently to enable eighteen UK staff, about half of them married, to live on the Port Trust Estate, while the rest of the staff continued living in leased premises in the city. 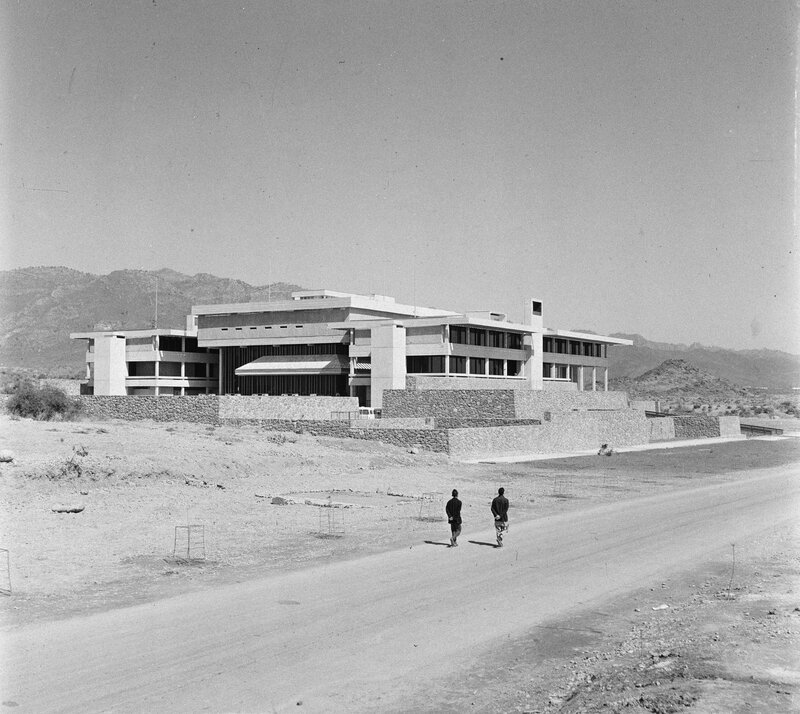 Islamabad was selected as the new capital of Pakistan in 1959 and an entirely different strategy became necessary for the Port Trust Estate which would be downgraded to a deputy high commission. By the 1960s, the offices in Karachi were in dreadful conditions: the high commission was in the Chamber of Commerce Building in Wood Street, British Information Services in El Markaz, and the Trade Commission in Finlay House. 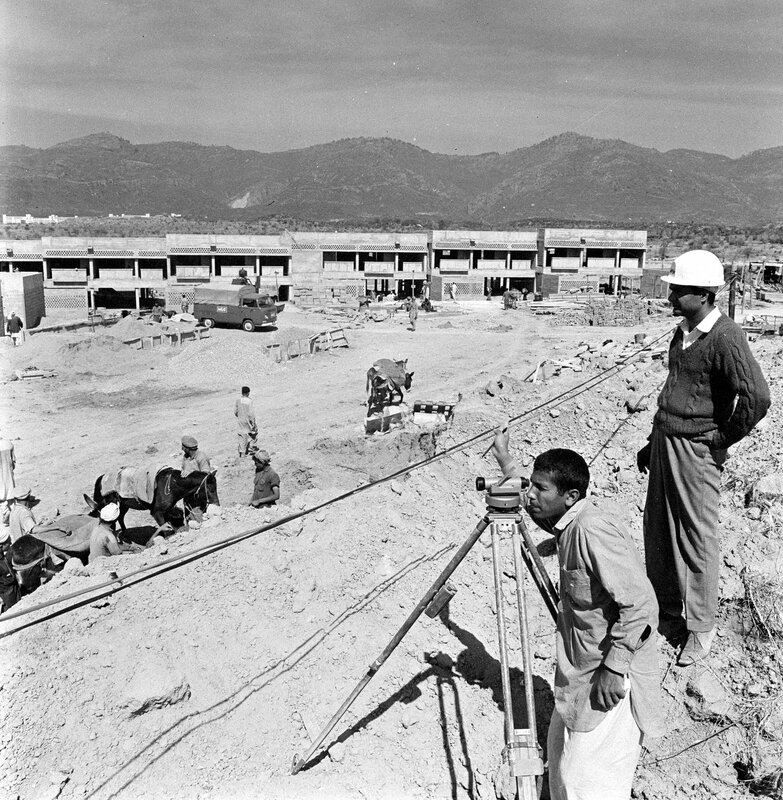 Senior visitors from the Ministry of Works recommended in May 1962 quickly building new offices at the Port Trust Estate, designed in such a way that about two thirds of the building could be converted to staff flats once most of the offices had moved to Islamabad at the end of the decade. A scheme was prepared to this effect and readied for a start on site in January 1965, but abandoned as too much of a distraction from meeting the pressures at Islamabad. The Port Trust Estate was by then a significant embarrassment because so little had been done with it in the fifteen years since it was expensively bought. 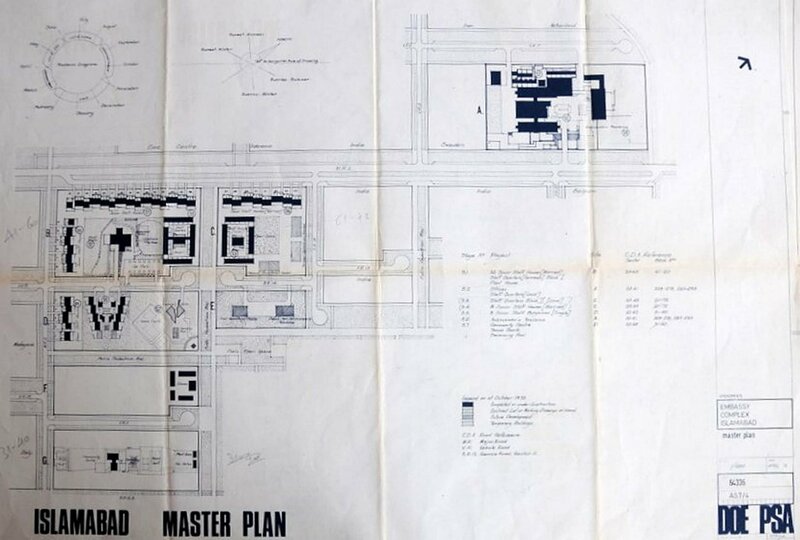 Documentation was therefore drawn up in 1965 to sell 99-year leases by sealed tender for the eastern two-thirds, comprising Acton House and fourteen lotted building sites: but that idea was also abandoned.